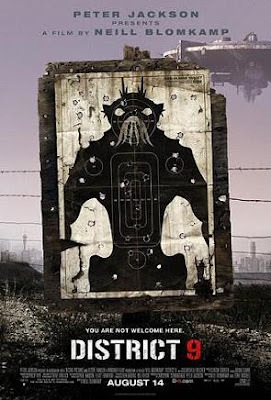 I was a bit fearful that District 9 would be a dissapointment. The last trailer I saw seemed to give too much away and after a fantastic viral campaign, that had whetted the appetite, this was a concern. I needn't have worried. The film didn't do anything I expected. The movies premise is a great one. I won't be spoiling anything by saying that a huge Alien space ship is hovering over Johannesburg (South Africa), it's inhabitants stranded and forced to live in a Ghetto called District 9. Except the insect like aliens have been here for twenty years and the locals want them out. The story starts as a private military contractor, the MNU (Multi-National United) are about to evict them to a new home. District 9 has become a slum, many of the aliens are living in squalor, stealing or bargaining with a group of Nigerians for cat food (their preferred food choice). District 10, where they are to be moved, looks like a concentration camp. There are obvious analogies here with Apartheid. Neill Blomkamp has said that the movie is not about South Africa's past, but the link is there, whether he wants to admit it or not. And it's done well, not over egged. The style is gloriously lo-fi, the film has benefited from not having an outlandish budget. Sure there are special effects and possibly my new favourite ray gun of all time, but they are nicely integrated with traditional animatronics. The fake news stories are used well to flesh out the story, it's almost like one of those made for TV movies about real events that mixes real news pieces with reconstructed bits. Clever stuff. Done before, sure, Cloverfield is an obvious comparison, but this is a better film than that. So is it a great film? Maybe. I think it's something new. It's refreshing to go to the cinema and have your expectations confounded. There will be calls for a sequel, there's definitely more story to be told here, but I love the ambiguity of the ending. Sometimes you don't want or need to find out what happens next. Be warned though, there are monsters in this movie, they're just not who you expect them to be. Can't wait to see this, so excited. I thought District 9 was good. Not "blow-my-mind" great, but good. I liked the fact that it was something new. In an industry that is oversaturated with re-tools and re-boots and re-makes *you get the point*, this was a glorious alternative. Totally agree that a sequel could ruin it. Loved it though. Kudos to Blomkamp for making such an interesting and thought provoking movie.